Nigerian yam can be made to be enjoyed by kids, both big and small. These crispy yam bites are the right size to pop into the mouth. 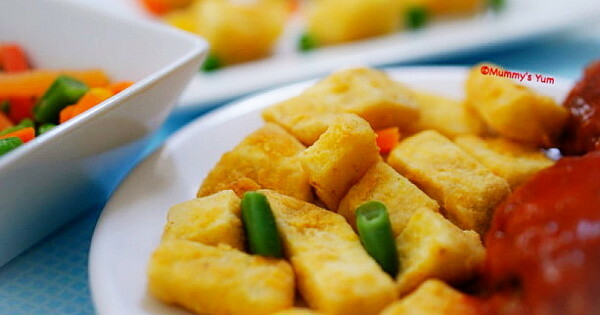 It is crispy and subtly crunchy on the outside, while the inside gives you that yummy yam softness. So, it’s not going to be a jaw-breaking yam-eating session that we used to endure in the past (lol). I covered these yam bites with a combination of flour and cornmeal. Yes, after discovering cornmeal and realising it is the same cheap abundant finely ground corn in our markets, I have to think of other ways to use it to our benefit. I have another cornmeal recipe developed and ready to be shared soon. These crispy yam bites are good enough to be snacked on and will also make it to the lunchbox for school. Put yam in a pot of water to cook. Once the water boils, add some salt and cook for a maximum of 10 minutes. This is to ensure the yam bites softens a bit without getting well done. Drain and allow to cool before commencing the next step. Mix the cornmeal, flour and seasoning together, pour into a ziplock bag or any bag you can tie. Break the egg in a bowl, whisk and set aside. Pour the yam into the egg and gently toss to coat them. You can alternatively put the yam bites in a bowl and pour the egg mixture over it…simpler right? Scoop the yam into the seasoned flour and cornmeal-filled ziplock bag. Shake the bag gently and ensure all the bites are evenly coated with the mixture. Remove from bag and put in a dry plate. Deep fry in hot oil until golden brown and serve with a dip of their choice.